To cast and for to Jig type Zenaq, Smith, Daiwa, Tenryu, Sakura, Shimano Aspire Saltwater, etc. Type STELLA 8000/10 000 ou SALTIGA SZ 6000 GT. POPPERS : Orion Magic Pop et CX. Halco, Roosta Popper 135 et 195. Hart Monster Pop et Pop A Log. Flashmer GT Victory. Yo-Zuri Surface Bull et Surface Cruiser. JIGS : 90 Ã 280 g Smith Masamune, River 2 Sea Zero Dropper, Ho Keitan et Otoko, Hart Weepy, Orion, Yambal etc. SPOONS : from 30 to 90 gr, type Spanyid or similar. Shock Leader : 80 et 100 LBS. Broken and welded rings NÂ°7 to NÂ°9. Swivels with balls without staple. 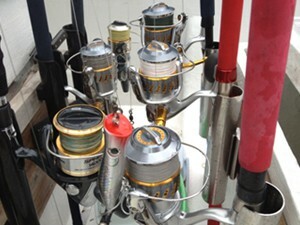 Triple fishhooks ST 66 OWNER. Do not forget your usual equipment to protect you from the sun ( sun glasses, solar protective cream, long sleeves Tshirts and your fishing gloves).